Cleaning ovens is hard, hard work and it is equally important to ensure that you have not left any traces of the cleaning product in your oven. Many products are abrasive and can damage the surfaces of your oven, and if you don’t clean your oven thoroughly, the residue left behind can affect the taste of your food. After spending ages cleaning your oven, does it still look grubby? 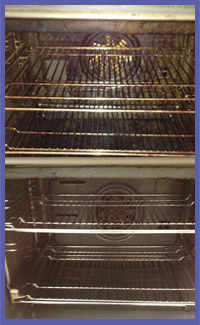 Why we should give your oven a professional clean? We can clean all gas and electric hobs and ovens.